The background of the icon represents Merton's 1) encounter Asian comparative studies and subsequent plan of going to Japan after his meetings with Tibetan lamas (which he never reached), and 2) claim of "settling down", with a possible hermitage in Japan, Alaska or the California Redwoods. The inscriptions are in a Japanese style font and the text chosen "Mercy within Mercy, within Mercy" is from his Epilogue to 'The sign Of Jonas'. "The voice of God is heard in Paradise: “What was vile has become precious. infinite: riches I love not at all. Prisons within prisons within prisons. powerful. I loved what was most frail. I looked upon what was nothing. 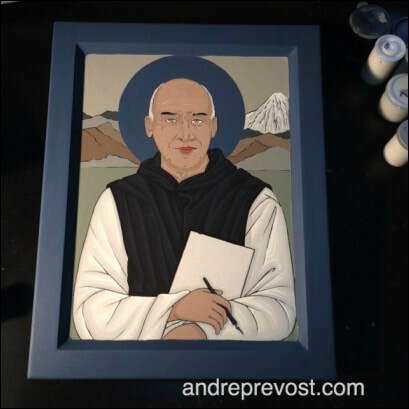 The Thomas Merton Icon has been completed. This original icon was designed following discussions with my client in Calgary, and who wanted a silver leaf rather then the usual gold. I was hesitant about silver leaf as I know that it tarnishes just looking at it. :-) And unlike the silver plate which can be removed from an icon for cleaning, there is no way of cleaning silver leaf without damaging the icon. I also knew that white gold will tarnish in time as well, so I recommended Palladium. The icon is 11" x 14" x 1.25". 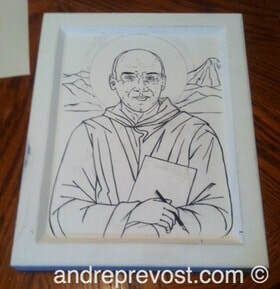 Just a quick picture of the Thomas Merton icon in progress. The first batch of patent Palladium was flawed and made leafing this icon very challenging. In the end I had to order another booklet of the leaf, and this time around, it worked as it was suppose to. There is still a fair bit to do in completing writing the icon, as well as adding the inscriptions. 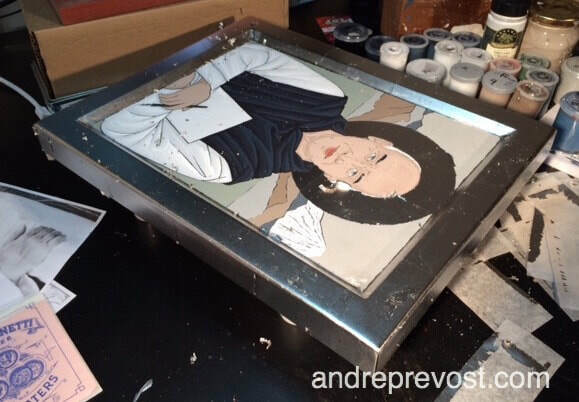 I will be happy to finally be able to send the commissioned icon to my client in Calgary. Well! That was certainly was a different journey; trying to get the icon leafed. The first book of Palladium patent leaf looked defective, being very uneven and filled with fine cracks and blemishes, but and both attempts to gild the icon failes. I was faced with having to make the decision to bite the bullet, and order another book of Palladium ($90). No sooner had I placed the order, I heard about a possible postal strike within days. Fortunately, the Palladium arrived in time, and then the postal strike has since been delayed. So the task was once again to sand the earlier layer of leaf and start over. This time, it worked as it was suppose to, and as all my gold leafing worked in the past. So again, it is possible that Palladium is either more challenging to work with or, it could be that this second book of leaf was a better batch. It wasn't uneven and blemished like the first book was. But in any case, I've given the new leaf its first coat of varnish, and can let it set for a few days while I make final preparations for the upcoming Sooke Fine Arts Show which opens on July 22nd. Two of my paintings from the Journeying With The Totems series have been accepted into the show. It is a relief to have finally reached the point where the leaf is done, and can move on to writing this new icon of Thomas Merton. Since getting the palladium leafing set on the Thomas Merton, I've been unable to do the touch ups and re-guilding the halo, thanks to the heat. It was 33° here yesterday and not much cooler indoors. So with the fans at full and sweating, there is too much disturbance in the air for applying gold size and a drop of sweat falling on the unsealed leaf would be a major problem. So I am having to wait until the temperatures cool down in the next few days (hopefully). This poor iconographer can't afford to have air conditioners installed. And without the palladium sealed yet, I am unable to continue writing the icon as I can't set my hand/palm on the unsealed leaf, leaving imprints on it. So with temperatures co-operating soon, I will be able to get get to work and complete this icon for my client in Calgary. Got the Palladium Leaf done tonight. It was so different laying something other then gold. The blue basecoat was the right choice to keep to enhance the cool cast of the Palladium. I've given the leafing a light burnish with a sable brush, to assure that it was all well adhered to the size, and touched up any spots where there were slight flaws in the leaf. That needs to be done while the size isn't fully dry. I now need to let it fully set for a day or so before I can really work the leaf with its final burnish, so as not to scratch the leafing. 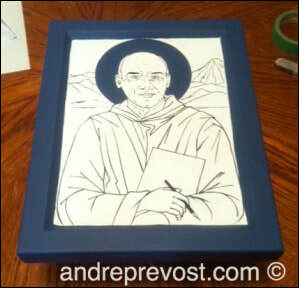 Progress on the 11'x14" Thomas Merton icon. Base colours in the background are in, and shading and highlights are underway. Rather then using a red base for the areas that will be leafed, I am using a blue. The reason being that this icon will be leafed with a Patent Palladium leaf which has a silver appearance (as expensive as gold, but doesn't tarnish like silver). I will need to do the leafing very soon as it will determine any colour adjustments in the background. 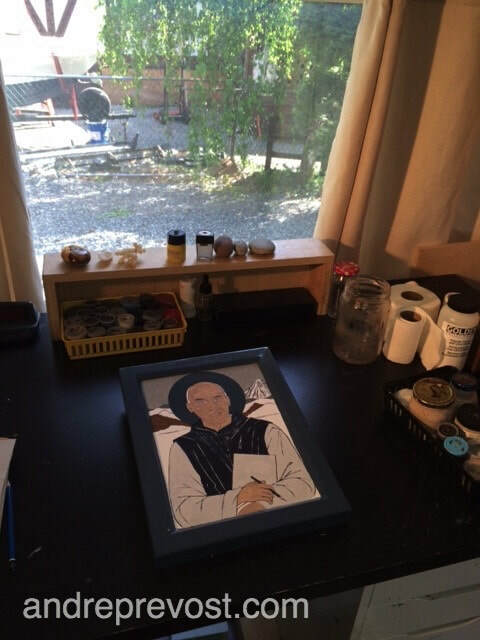 The dust has settled from the big move to the Island, and with the larger 22"x28" icon of St. Thomas Aquinas being completed (and being delivered tomorrow), I am now working once again on a 11"x14" icon of Thomas Merton which I had started just before the move. This one will bring a new experience of using Palladium leafing. But while I work on the Merton icon, I just wanted to let it be known that the studio is indeed up and running and I am eagerly awaiting more commissions, large and small. I am also be available for church mural/ornamentation work on Vancouver Island. If you know of anyone considering a commission or project, I would appreciate the opportunity of presenting mys work for consideration. I'm taking it one day at a time, aware that much needs to get done, and timelines to meet. This particular move had an added component, even though having more living space for my son and I, I didn't have adequate storage for my reference books, archives, etc. I've had to be brutal in my purging (which began when we ran out of space on the rented truck on April 1st). 27 days later, most of the boxes have been dealt with, even though there are still some things that I haven't found yet. Every square inch of available storage space is used up, and I have enough garbage and paper recycling to fill the van. 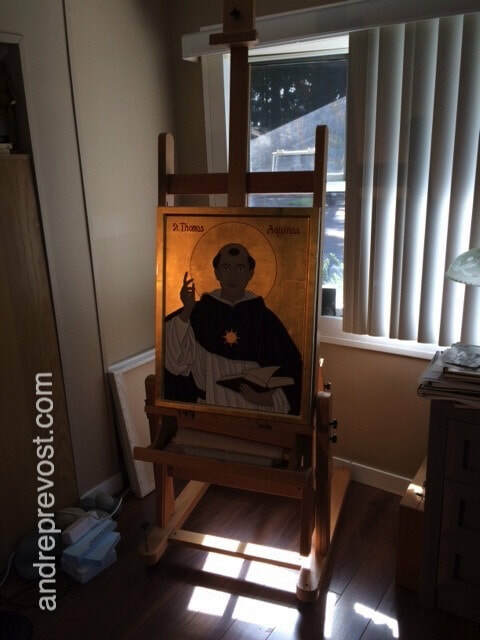 I was finally at a point yesterday where I could safely unpack both the St. Thomas Aquinas icon and the Thomas Merton icon. I can now gradually get back to writing those, knowing that I have two critical items to take care of as well; filing my 2015 taxes (which I still need to sort through) and preparation of my submission for the upcoming Sooke juried Art Show this summer. The booklet of Patent Palladium (25 - 3"x3" sheets) arrived yesterday for the Thomas Merton icon. It will be an interesting introduction to working with Palladium. I'd always avoided any silver leaf or white gold as both tarnish. But Palladium has a silver finish and doesn't tarnish. But it will be a different process as i will need to use a different base colour other then the traditional red bole for gold. One question that I need to check into is the sealer that I use. It is pretty clear and has very little colour to it when new. But all varnishes darken a bit with time, which is fine for gold leaf, and I'll need to test it on a sample to see if it alters the silver finish. If so, I will have to order a new sealer from Calgary. My new studio space is definitely different from the one in my previous condo, but as with all spaces, there are pros and cons to each. There have been a few trade-offs. - My new studio space is less defined but the living room nook is adjustable as required. - I have lots of natural light whereas my previous studio had none. My studio table has a northern window and the easel area has an eastern exposure. - I have no way of adding track lighting in the new space but I've improvised 2 mic stands with clip-on halogen flood lights which may be a bit too bright but I can adjust their positions as I need. With a job interview coming up on Tuesday, this was a good time to do the first coat of gold size on both the St. Thomas Aquinas and Thomas Merton icons. That will give the size 2 days to fully set. So, starting this Wednesday, I will sand all red boles surfaces. This is the first coat which is important for the next step. It seals the red bole surfaces with a hard finish, which can be sanded with a very fine grade sandpaper. While setting, the gold size also pools into the small imperfections in the red role. While sanding, it is easy to see any remaining imperfections, which may be taken care of with more sanding with a 400+ sandpaper. On occasion, if I am not satisfied with the quality of finish, I will decide to do another coat of gold size after thoroughly removing and dust or grit. If so, then it adds another 2 days before I can sand once again. Once satisfied, I can proceed to the next step in preparing for the gold leafing. 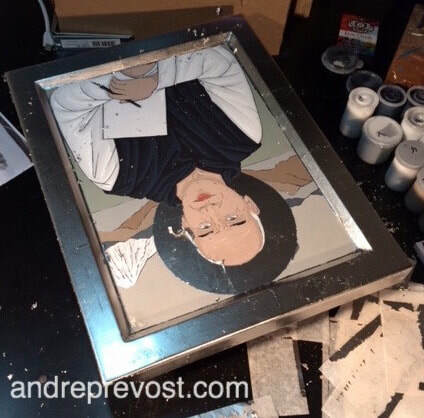 The Thomas Merton icon itself will have to wait for the leafing as the Palladium will have to be special ordered once I have the funds to do so. I was able to put in a good day on the St. Thomas Aquinas Icon yesterday, but I needed to get the Thomas Merton Icon further along today. I'm very conscious of the fact that my son and I have to vacate our current home (and my studio) on March 31st. and with no idea where we will be after that. The board and gessoing was completed earlier this morning and the design was transferred and inked in. The unusual aspect of the Merton icon is its blue, instead of the usual red bole wherever the leafing will be. The reason being is that I will not be using patent gold leaf on this icon. The commission requested a Palladium patent leaf. It is the more stable substitute to silver leafing. Silver leafing, no matter what precautions you take, and even with varnish, will tarnish. Even White Gold leaf will tarnish. Palladium won't. It will be interesting how the blue will guides the process.